ACME had a blast participating in Portland Winter Light Festival (PDXWLF) this past weekend with our Lite Brite Remastered installation! PDXWLF is Portland’s premier outdoor winter arts event that transforms, illuminates, and animates the nighttime landscape. The event is designed to inspire both adults and kids through the combination of art and technology. This year they did just that, with more than 100 artists and organizations featured, including ACME! After hearing the theme was “The Light of Progress,” our team had the thought that progress comes with reflection of the past, and with a look to the past the Lite Brite came to mind. The true goal for our installation was to add a fresh taste of technology to a game that has transcended generations and inspired thousands of imaginations. This interactive piece allowed participants creative power, creating a symbol of the future with an item of the past. In the three weeks leading up to PDXWLF our team rallied to build the parts and pieces necessary for our 6’ tall and 8’ wide concept to become reality. With creativity comes innovation, and it’s fun to note that we combined the use of precision instruments with average office supplies to make the interactive piece come together. Without giving away all of our creative secrets, we will say that a good portion of what made the Lite Brite work was a standard office thumbtack. The thumbtack partners with a small magnet to make the contact, which changes the color with every turn of the peg. How cool is that? Joseph Hewitt, the Creative Technologist for ACME and creator of our installation, blends aspects of technology into full blown consumer experiences, and this was no exception! PDXWLF continues to be such an incredible FREE community event with so many innovative and creative installations. A huge thank you to the PDWLF administration and volunteers for their support throughout, they are rockstars! We also want to say thank you to everyone that visited, you made this year’s festival the biggest one to date! 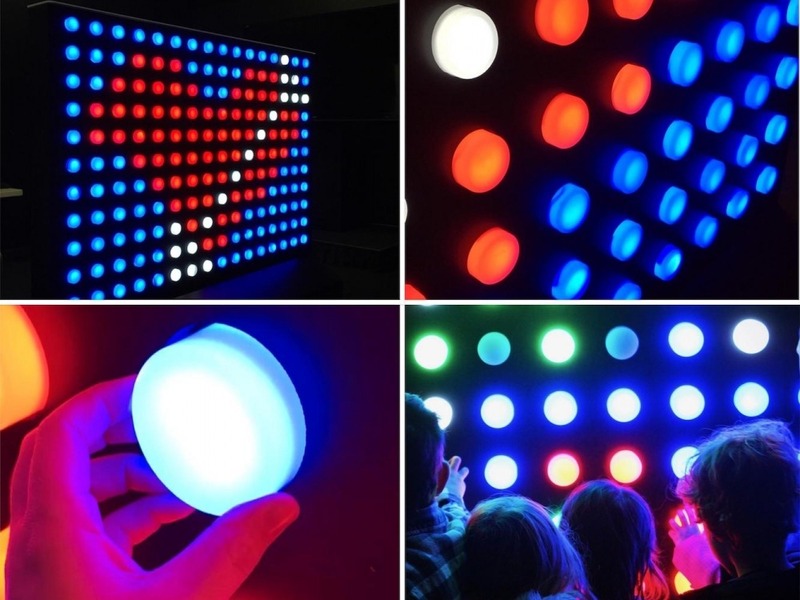 We couldn’t be more thrilled that our life-size interactive Lite Brite was a hit by all! If you weren’t able to stop by this year, be sure to set the date for 2019!